Bend, Oregon's Deschutes Brewery is well known throughout the United States beer drinking community for their standard standard fare of affordable yet classy brew. You can walk into pretty much any grocery store that has a respectable beer selection and find Mirror Pond Pale Ale, Black Butte Porter, and Obsidian Stout; and their Green Lakes Organic Ale has long been a staple of WestToast.com staff. Imagine my elation, then, when I learned that Deschutes had even MORE to offer: The Reserve Series. A collection of special, relatively small-scale distribution, The Reserve Series represents the the brewmasters playground in a way. With a price point between $10.00 - $16.00 for a 22oz wax-dipped bottle, reserve beers aren't for your every day sipping; they certainly make a special treat though. 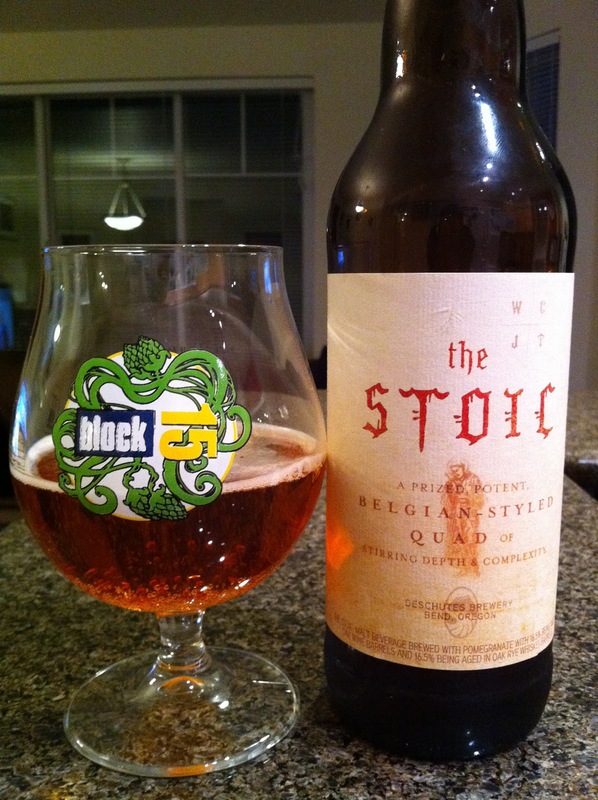 In August, Deschutes released The Stoic, a Belgian-style Quadruple and the latest in the reserve lineup. I couldn't wait to try it. [The Stoic is] a simple recipe ironically hard to brew. The classic malt bill is all Pilsner malt. Hallartau, Czech Saaz, and Northern Brewer hops sustain a deftly understated flavor. Belgian candy sugars add impact and the smooth body required of any Belgian-style brew worth quaffing. A healthy portion of pomegranate molasses casts an opulent, tangy twist, while a vintage Belgian yeast strain provides a solid reference point. Pinot Noir and Rye Whiskey barrel-aging suggest notes of spice, citrus, pepper, vanilla, and toasted caramel like offerings to the ancients. With an ABV of 11.5%, IBU of 20, and partially aged in Pinot Noir and Rye Whisky barrels, I knew I was in for a treat! Appearance: Lightly pink in hue, The Stoic has a slightly effervescent quality which bubble up the side of the Belgian glass I was drinking out of. Aroma: Immediate notes of the classic belgian yeast and sugar are complemented by hints of pomegranate and a bit of oak. Taste: My first reaction upon tasting The Stoic was "sweet." Then, the flavor profile transitioned into a tart finish with a backing of oak and whiskey on the palate. This beer is complex! As it warmed up a bit the fruitiness opened up, bringing the pomegranate to the table to play. Depending on your mood and what you are looking for from the beer, The Stoic it could be a standalone refreshing brew, a more complex after-dinner dessert beverage, or would do just fine paired with some fresh seafood. A unique, complex beer, The Stoic is unlike anything you've ever tasted from a beer - and probably will ever taste again. It's definitely worth the trip to the store to pick up The Stoic, and also while you're at it you might as well learn how to easily open a wax-tipped bottle of beer. Hint, make a vertical cut up the side. I like scotch. Scotch scotch scotch. We want you to swoon over Tapeña!